Alan Gardner produces the blog The Daily Cartoonist, which in its brief lifetime has become the most reliable and effective aggregator for news affecting the newspaper strip and editorial cartooning worlds. It is one of a half-dozen can't-miss stops on the link-seeking rounds of the modern comics blogger: between The Daily Cartoonist and Dave Astor's work at Editor & Publisher, the interested reader will find somewhere between 98 and 100 percent of everything they'll want to know about that corner of the field. TOM SPURGEON: Alan, I came to your blog late. Can you describe how you ended up blogging comic strip news? Did you start out with your current output in mind? 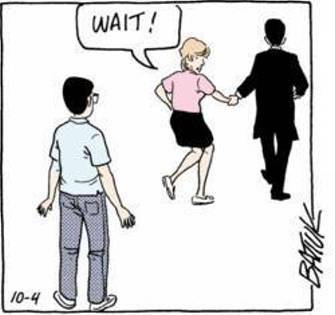 How long have you had this interest in the strips? 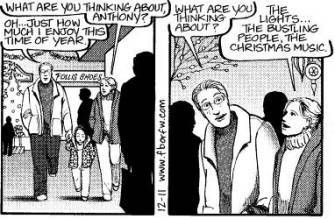 ALAN GARDNER: I had always intended on cartooning for a living either as an editorial cartoonist or with a comic strip. I did both in college and worked at a daily paper as their editorial cartoonist. This is back in the mid- to late-'90s. When my wife and I found out we were expecting triplets, I left the newspaper for a higher paying job in web development. Then in 2005, I started to get that itch to start cartooning again, but with the current state of the newspaper industry, I wasn't sure where I should focus my efforts. I started the blog as an excuse to get caught up on the market place and to experiment with blogging in general. Since most of my experience in cartooning was newspaper based and I knew who the players were, it was an easy leap into this space. SPURGEON: How was your 2007? It seems to me that you engaged more complex issues and took advantage of your increased talkback traffic. How is Daily Cartoonist different than it was one or two years ago? GARDNER: I think this year could be described as the year that The Daily Cartoonist became a community. The number of visitors getting involved in the comments has grown and so it makes the site a much more interesting read. My audience consists of cartoonists, syndicates, fans, and newspaper editors and to varying degrees they're all commenting on the blog, so it has opened up the discussion a bit on a lot of topics. Often in this industry you have the three parties (cartoonists, syndicates, and papers) and they all make assumptions about each other and what I'm starting to see is a genesis of where the three can have conversations about issues of interest. Another change is the perception of The Daily Cartoonist. It's been cited as a source in a couple of major publications this year and became a popular sounding board for anyone wanting to comment on the Funky Winkerbean/Lisa Moore story. SPURGEON: At the very beginning of 2007, FoxTrot went from dailies to Sundays-only, opening up hundreds of daily slots. Other than a few strong gainers like Lio, the dailies openings seemed to go to a lot of different strips instead of one perceived replacement, as had been seen in the past when a popular feature reduced its output or retired. What do you think this says about the state of the market right now? GARDNER: Janet Grimley, assistant managing editor at the Seattle Post-Intelligencer, was quoted in a recent Wall Street Journal story that features editors should look at the comics page like a stock portfolio and diversify. I think that's what we saw earlier this year as a large number of features editors were forced to take a look at their "portfolio." The market offerings for years have been heavily tilted toward family features, so in hindsight, it's easy to see why editors would begin to explore other features. 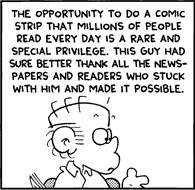 On a related note, I think the FoxTrot retirement as a whole as been positive as it allowed some really good talent like Mark Tatulli, Stephan Pastis, and Paul Gilligan to gain clients faster than they normally would. Makes you wonder what the landscape would look like if more of the larger features retired rather than become legacy strips. SPURGEON: For that matter, how do you look at the strip market overall? At the end of the year a couple of major papers -- the Houston Chronicle, the Washington Post -- radically altered their commitment to that section. Can we expect more such adjustments in the future? GARDNER: There is anecdotal evidence to suggest that the number of spots on the comics page is shrinking. When I talk to the syndicates about this, without exception they all tell me that business is good and that they're gaining or selling more of their comic features than before. Well, I don't know how all syndicates can say they're increasing their sales in a declining market unless they're either lying or they're counting internet sales as separate clients -- much like selling the Sunday version of a strip is counted as a separate sale than the daily version to the same paper. If that's the case, then I think it confirms the trend demonstrated by larger papers, like the ones you cited, which seem to be dropping printed features and increasing their web offerings. Papers win three ways -- they cut their print costs, they can tell their readers that their beloved feature is still available, and they can use the feature to increase ad revenue on their web site. On that last point, I don't know how well that is going. Historically comics pages are ad-less so newspapers haven't been able to generate ad revenue on one of the most popular pages in the paper. But on the web users expect advertising so, at least in theory, the comics page could be a revenue generator for once. I think I strayed from the question a bit. Yes, expect more adjustments. 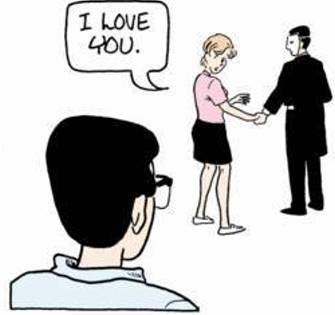 SPURGEON: What do you take away from the intense interest in the content of two strips, the Lisa Moore storyline in Funky Winkerbean and the Anthony/Elizabeth storyline in For Better or For Worse? Is this proof of the continuing strong appeal of the strips or a kind of focused interest that shows they're only being read by a kind of intense fan and not the general public? GARDNER: I think the source of interest in these storylines are a bit different. Interest in the Lisa Moore storyline had a lot to do with the publicity it generated because of the topic and controversy of having a main character die from cancer. The Anthony/Elizabeth story was probably more homegrown with longtime readers. Regardless of the source of the popularity of the storylines, both features demonstrated the power that comics can have on people. We, and I'm talking the general reader, can become very passionate about comic characters that is not shown for book, TV or movie characters. I don't claim to understand the phenomenon, but it's real. SPURGEON: Where do you stand on the appropriateness issue that came up with the Lisa Moore storyline, where people felt it was simply too awful to have to deal with issues surrounding cancer in what might usually be seen as a respite from such real-world difficulties? GARDNER: I'm not sure where the moniker "funny pages" came from or when it started, but it has been a stumbling block for many features that want to branch out beyond the gag-a-day world. Comics, like I mentioned, have a great deal of power to impact readers and when they're pigeon-holed into mantras like "comics are supposed to be funny," then comics can't reach their full potential. To me there is a larger question raised with the Lisa Moore storyline and that is why did this have to be so controversial? Every other media has the freedom to tackle any topic it wants, why not comics? That's more depressing to me than a comic character dying. SPURGEON: After all the back and forth, where do you think your readers stand on the Schulz biography? Flawed? Downright manipulative? Goes with the territory? Was the reaction different to the American Masters program, do you think? What's your opinion on either? GARDNER: I think most of my readers have already read or will probably read the biography. There's been enough evidence provided by the Schulz family that the book is flawed and most will read it knowing that this is not the definitive volume on Sparky. That in my mind is the greatest disappointment of this whole book -- that Michaelis' unparalleled access to so many sources and material that he could have written the authoritative book the man who's had the most impact on comics ever -- and he didn't. The American Masters program did present Sparky more fairly based on the comments on the blog. SPURGEON: Is there anything we can take away from Berke Breathed being pulled from papers in August for what seems to me at least like some really benign humor regarding Muslim dress? Are papers over-sensitive to this kind of material? GARDNER: Mostly it shows how our society has become overly sensitive and politically correct. 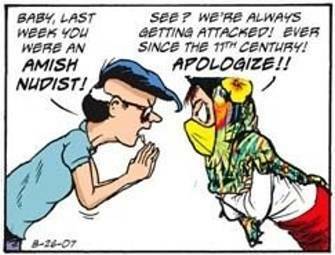 We can't talk about race, religion or many cultural issues without being branded as a anti-this or anti-that and if we can't have those kind of honest discussions in real life -- it can't happen in the comics where stereotypes are often used as a quick way of setting context for the punch-line. A related event happened in November when the Beloit Daily News (WI) temporarily dropped Non Sequitur for [what] really amounts to a misinterpretation of a weak joke mentioning the KKK. SPURGEON: Alan, do you think the recent wide and high-profile availability of a lot of classic material has had any effect on the modern consumption of strips? Do you enjoy any of those series? 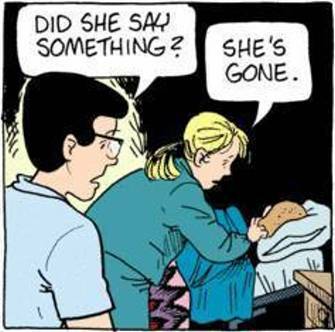 Do you have any favorite ongoing strips? GARDNER: I've been amazed at the number of classic compilations have been made available in just the last two years. The box sets are so much nicer and provide a richer experience. If I didn't have to wait decades for a current feature to show up in a box set, I'd get rid of all the paper back collections I have in my library. The week leading up to Christmas this year, I pulled out the Calvin and Hobbes box set and read all of the Christmas story-arcs with the kids. That would have been incomplete and time consuming with paper backs. 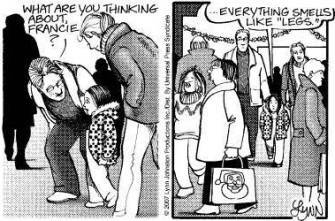 Now you asked about the classics having an impact on modern consumption of strips. That's harder to pin down and I'm not privy to the type of data one would need to say that authoritatively. I look at it this way -- the books are doing very well, or well enough that they keep coming out with them. That has to show that there is a high interest in comics. Why then are editors reducing their comics instead of increasing them? What marketing genius thinks they can offer less at the same or increased price and expect people to continue to buy it? As to what I read, I signed up for two of the three comic subscription services and get 53 comics and editorial cartoonists delivered to me each day -- too many to mention here. SPURGEON: Is it my imagination, or between the Clay Bennett to Chattanooga story and the kind of aggressive stance on promoting their strengths that came out of the AAEC meeting, did editorial cartooning news seem more hopeful this year than maybe the last few? You wrote about the editorial cartoonist as victim stance in August; what was the reaction to your piece? GARDNER: I'm not sure that much has changed from 2006 to 2007 and I don't think there was any organized effort coming out of this year's convention. That's why I wrote what I did. There is a cyclical story that appears without fail each June before the convention -- usually in the local paper where the AAEC is holding their convention. It's always how the staff jobs are dwindling. While there has been a great deal of talk on how to reverse the trend, the only thing that is presented to the public is the "hey feel sorry for us" story. It's depressing. There was less reaction, at least publicly, than I had anticipated to what I wrote. 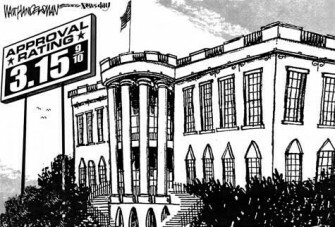 There were some who felt that there are efforts to paint a better picture of editorial cartooning, but I don't think there was much disagreement that the current messaging is working. SPURGEON: Do you have an opinion on whether or not the Pulitzer should have animated cartoons as part of its judgment slate? GARDNER: I think it was a big deal this year because of the absence of something bigger to talk about -- no Mike Luckovich "Why?" cartoon to merit the prize. I believe the impact of an editorial cartoon is greatest in pen and ink form and the award category should reflect that. Animation is new and raises questions about fairness -- the biggest being that not all cartoonists do all the animation themselves. Preferably, I would have liked to see the board wait a couple of years more to see if animation really becomes something more than side projects for cartoonists and if so, then to give it its own category. SPURGEON: How big a story was the transition from the late Jay Kennedy to Brendan Burford at King Features, in your opinion? How have you felt about Ted Rall's work with United thus far? GARDNER: Aside from your interview that you did with Brendan a month or so after he assumed Comics Editor, there wasn't a great deal of ink on the topic. Perhaps it didn't seem right to hype him up right after Jay's passing. As far as Rall's work, it's clear he's aggressively looking for talent and not just reading the submissions. That gives United an edge over more passive syndicates. With Family Tree in January, he will have launched three features and each represents one of his sources -- the web (Diesel Sweeties), his network (Family Tree) and submissions (Secret Asian Man). Of the three, I don't see a clear soon-to-be-classic, but they're stable offerings which is about par for the other syndicates. SPURGEON: Do you feel there's still work to be done to prepare comic syndication for the increasingly on-line presence of daily newspapers? GARDNER: In some regards, I wonder what work has been done. The big three syndicates have their own online presence with subscription services, but why they have product offerings to compete with newspapers instead of support them, I haven't figured that one out. I don't know when they will launch, but I know two of the syndicates, Universal and United both have significant upgrades to their web sites that will roll out in 2008. I've seen Universal's and it has more community features like tagging and commenting. Again, the syndicates are investing to in make their own sites destination spots, but how that helps their cartoonists get into more papers or online papers where they make money, we'll just have to see. SPURGEON: Have you any thought about what we're going to see in 2008? What might we expect to see on your site? GARDNER: I haven't really thought about it. Last year I made few predictions that failed to realize, so I'll skip making any more. As far as the site, I have four major feature enhancements that I hope to roll out next year to help boost the blog's community. I'd really like to reach out and bring more newspaper editors into the discussion and hopefully some of these things will help out in that regard. this marks the final entry in this year's CR Holiday interview series. Thank you to all that participated. Several interviews originally planned for the series will appear on this site in the near future.